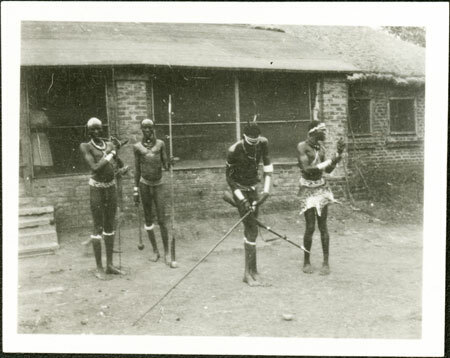 A group of four male youths (one in feline skin loincloth, possibly the potential bridegroom) outside a thatched brick building (probably the American Presbytarian Mission at Nasir) with white women looking on through the windows. Two of the youths accompanying the suitor carry spears and one has a rifle held between his legs whilst he fixes the end of a ?spear. It is noted that they are about to begin marriage negotiations with a girl's relatives concerning bridewealth. Note on print reverse ms pencil - "5 16 "
Morton, Chris. "Nuer youths at ?mission" Southern Sudan Project (in development). 03 Jan. 2006. Pitt Rivers Museum. <http://southernsudan.prm.ox.ac.uk/details/1998.346.16.2/>.